The lovely illustrations by Katie Eberts really caught my attention. I like the simple stylized drawings of all the ingredients, the fruits, vegetables and other edibles. 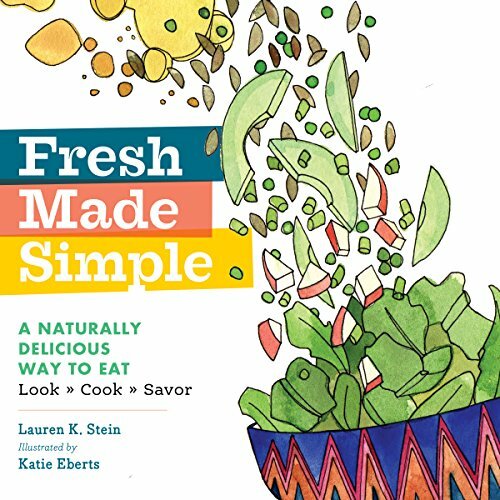 This is a cook book with 75 recipes with a focus on vegetables and fruits. The recipes are simple with no exact measurements. Each recipe is drawn with all the ingredients coming together with bits of instructions. They are simple to follow and anyone can cook with them. It's more like tossing all the ingredients together. LOL. But the final product sure looks good, well, at least that's what the drawings seem to imply. It's a very nice cook book with wonderful art.